Photo by Michelle May. 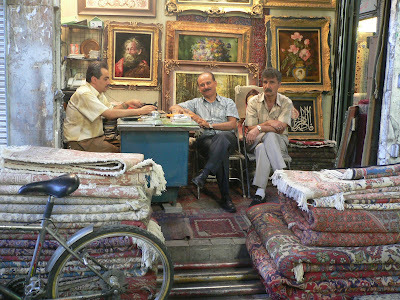 A shop near the Tehran bazaar. As we Iranian Americans recount all too often, we are doctors, lawyers, engineers, artists and even elected officials. We are considered to be one of the (if not the) most successful immigrant groups in the United States. There is one more thing that we are, however, that none of us ever wants to discuss: Rug dealers. Stereotypes are a funny thing. Usually they’re based in those same one-dimensional negative experience of the perceiver, probably housed in a section of the brain that’s hard to control. And regrettably these experiences often feel very real. The Persian Rug Dealer has become a pillar of American stereotypes: They’re cheaters, shysters, they employ shady marketing practices, they just won’t go out of business even though they promised they were about to years ago, they are nothing more than used car salesmen, no one can be trusted less. Not even the self-congratulatory “Persian,” nor the staunchest Iranian apologist will stand by their rug-selling brethren. As the son of a rug man, I’ve seen this typecasting played out thousands of times, in hundreds of different ways, watching the line between innocuous stereotyping and racism crossed almost daily. At first it hurt a little, but then I realized that this stigma was so ingrained into people’s thinking about rug men that it wasn’t even worth combating. Most of the rug men I knew had decided that it came with the territory and the only defense seemed to be even more over the top in their chicanery. Over the past couple of years, however, I’ve witnessed an interesting trend; rug shops have become one of the few places where average Americans feel good about asking their Iran questions. As one of the few groups of people who actually do business with Iran, rug dealers are of course a natural source of information on Iran. Their opinions are as biased as anyone’s to be sure, but their attitudes are also more well rounded than the Iranian who hasn’t returned in thirty years or the one who goes back for two weeks every summer. Anyone importing regularly from Iran has a complex understanding of that country’s economy, business practices, public sentiment and every other social barometer imaginable. Thus far though, it’s been mostly a missed opportunity. For most rug men their Iranian-ness has come to represent one more barrier to a sale and therefore something better left out of the conversation with their clientele. My feeling though, is that we can’t hide from who we are. Real success comes when we’re able to embrace ourselves, warts and all. I’m Iranian, not Mediterranean or Spanish; and I’m the son of a rug man, nothing more nothing less. For a crash course on Persian Rugs, click here. You are currently browsing the archives for the Persian Rugs category.